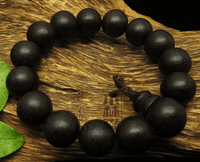 14MM Agarwood Wrist Mala Bracelet Vietnam Agarwood Beads Bracelet. This tibetan malas was handmade in tibet from AAA Grade Vietnam agarwood beads. Beads size: 14mm. Agarwood(or just Agar) is the resinous heartwood from Aquilaria trees, large evergreens native to southeast Asia. The trees occasionally become infected with mold and begin to produce an aromatic resin in response to this attack. As the infection grows, it results in a very rich, dark resin within the heartwood. The resin is commonly called gaharu, jinko, aloeswood, agarwood, or oud, and is valued in many cultures for its distinctive fragrance, and thus is used for incense and perfumes.